Terroir: a Nova Scotia Survey is on view until January 15, 2017. The accompanying exhibition publication is now available for pre-sale at the Gallery Shop. What is your connection to Nova Scotia, and why were you inspired to submit a work for this exhibition? My ancestors settled in Lunenburg County in the 1750s, and I grew up in Bridgewater. It was touristy for sure, but it was also so closely connected to my family’s history that it really sparked my imagination as a kid. I remember feeling a sense of having an inescapable connection to the past, and I think that having constant access to places of historical and familial significance helped to foster that. I’ve since lived in other parts of Canada, and this has helped to crystallize my evolving relationship with the landscape “back home”. Viewing Nova Scotia from a distance brought the idea of nostalgia to the fore: experiencing the landscape through the lens of social media, the lens of the tourism industry, and through the lens of my own personal and emotional history here, all coalesced into inspiring my work. I was thrilled to learn that the Art Gallery of Nova Scotia was looking to have an exhibition highlighting contemporary art of and about the Nova Scotia landscape. In some ways I feel like I wished this show into existence – I can’t think of a better venue to show my work in than in conversation with other artists dealing with similar themes. Can you tell us a little about your work that is on view? The name Turf & Twig points to a specific kind of land seizing ritual that took place during early settler colonialism in Canada. By tapping into figure painting’s ability to conjure both contemporary and historical narratives, I aimed to explore the evolving relationships we have with the land in Nova Scotia – colonially, commercially, and emotionally. This work was pivotal in my move from claustrophobic interior scenes to dealing with the landscape. I think that the sense of anxiety remains, however, as the dense forest and clearing can be read as reminiscent of a staged set. Because the source image for the landscape was found on a real estate website, the focal point isn’t a picturesque vista, but rather a “liminal” space with its past removed from view and its future yet to be determined. Properties that have been “primed for the taking” are seen as useful to potential buyers as they are then able to project fantasies of their future on these so-called vacant lots. That charged place between memories of the past and ideas of the future is where I tried to position the girl, the plant, and the brushstroke. Your work is on view along with 28 other artists. How do you see your work within the context of this group exhibition? Terroir: a Nova Scotia Survey does a great job of highlighting the central role the land plays for the inhabitants of this province by showcasing artists whose work reflects such strong yet complicated relationships with it. Surrounded by works of great criticality, I see my piece Turf & Twig as engaging with ideas of home and permanence, invasiveness and temporality. I am so proud to be a part of an exhibition that escapes the tourist gaze and reflects on contemporary relationships with the Nova Scotia landscape. What are you working on in now, or planning for the near future? I am still busy exploring the possibilities of linking figure painting to contemporary and historical Canadian real estate practices. I’ve been staging photoshoots in short-term rentals both here in Nova Scotia and where I’m currently based in Waterloo, Ontario. Right now I am in the early stages of work on a series of paintings that I am delighted to be showing next summer at ARTsPLACE Artist Run Centre in Annapolis Royal. How has your artistic process developed over time? What informs your practice? Painting has always been a mediated process for me. I have always prevented it from being too straightforward by including some element of collage or disruption. Starting out, I was keen to incorporate an element of chance into my work, and I would re-work paintings by introducing or eliminating crucial parts of the picture until “just enough” information was left to form a visual metaphor. This was a fun process, and it was very good at helping me overcome mental blocks. The build up of mark making spoke to the process I used, and in a way these formal decisions started to become narrative clues. I’ve since moved on to a process that involves more planning and foresight, but I always leave room for revisions. I construct my narratives three-dimensionally now, in rented spaces, with professional models and props. I’m still cognizant of trying to create a tension in the paintings between what is depicted and what is missing from view. I guess the biggest change to my process is that I do a lot more “pre-production” type work now. This has also been in response to the type of subject matter I am pursuing, which exists in less of a psychological vacuum and more of a contemporary context. When you’re not working, what are activities/interests that inspire your practice? Besides painting, my primary activity for the last two years has been trying to figure out how to best be a mother while still being an artist. Finding my footing in this new role has definitely influenced my work and inspired me in lots of ways. My most recent series of paintings entitled Attachment touched on themes like tensions within relationships and symbiosis between parents and children. My interest in understanding people and all of our successes and failures is what possibly led to being drawn to working with real estate imagery. I do love seeing how people live and am utterly curious about all the decisions we all make. 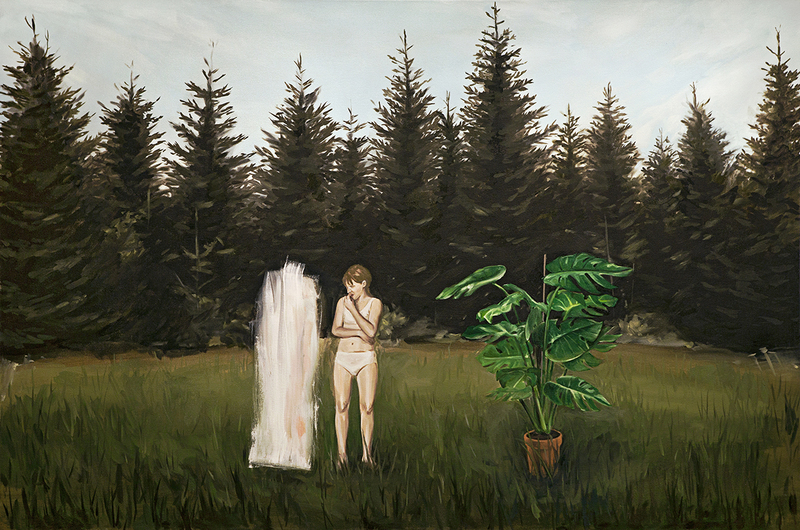 Turf & Twig, 2013, oil on canvas, 122.00 x 183.00 cm. Courtesy of the artist.